Ray Preston: Alright, two things. Number one, I saw you with a camera out there. You’re getting a kick out of all this, aren’t ya? Annie Wersching: Oh my god! My cheeks are like being pulled up to the sky! *laughs* I’m so excited. Ray Preston: How come? You just a huge baseball fan in general, or what? Ray Preston: So if you’re from St. Louis, gotta ask you what high school you went to? Ray Preston: Number two, I saw you taking [inaudible]. Annie Wersching: I’m glad I made contact, [inaudible]. Ray Preston: So what are you gonna be doing in the game? Annie Wersching: I’m catching. And I’m batting second after Vince Coleman, before Ozzy Smith. Ray Preston: So how’d they decide to put you in catching? Ray Preston: So how did you come from this point, St. Louis [inaudible] to the All-Star game here, [inaudible]. Annie Wersching: Ohhh, it’s so exciting, it’s so fun to come back. I come back all the time, but it’s so fun to come back and the city just be so energized and people are [inaudible]. Ray Preston: Are you gonna be able to brag a bit about your home town? 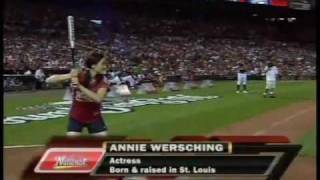 Annie Wersching: I loooooove St. Louis!